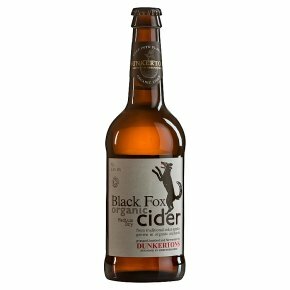 The Dunkerton cider mill is set in the ancient parish of Pembridge, where the legend is of a mythical fox 'as black as night, so that it might live in a man's shadow and so never be seen'. Fruity, off-dry and deliciously spiced, Black Fox has a good bittersweet bite on the finish. Pair with gourmet sausages. Organic. From traditional cider apples grown in organic orchards.